Early cartographers used terra incognita to delineate unknown or unexplored lands—most notably much of Africa below the equator and remote parts of the New World. In the opinion of Daniel J. Boorstin, author of The Discoverers, these two words are "the most promising words ever written on the maps of human knowledge." Terra Incognita Films continues this voyage of discovery, producing documentaries that explore the unexplored, films that map the unknown territories of our current knowledge—be they events or individuals or ideas. 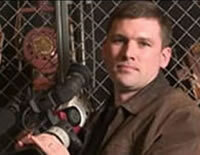 Ron Lamothe, founder of Terra Incognita Films, was born in 1968 and grew up in Lunenburg, Massachusetts. He received his B.A. in 1990 from Tufts University, where he studied clinical psychology and political science. Following a 1990-1991 trip through Africa, Ron moved to Washington, DC, and taught at DeMatha Catholic High School for three years. After a 1995 sojourn in Prague, he relocated to Leverett, Massachusetts, and soon thereafter enrolled in the history M.A. program at the University of Massachusetts, Amherst. It was here that he also discovered documentary filmmaking, and in 2000-2001 began production on The Political Dr. Seuss. Ron moved to Cambridge, Massachusetts, in 2003, to study African history at Boston University. In 2004 The Political Dr. Seuss aired on the PBS series Independent Lens. His documentary on Chris McCandless, The Call of the Wild, was released in September 2007, and following its 2007-2008 film festival run was picked up by PBS in 2009. In May 2010 Ron received his Ph.D. from Boston University. He has taught college courses in African history and digital video production at Clark University, Holy Cross, Emerson, Boston College, UMass-Amherst, and Dartmouth College. In 2011 his book Slaves of Fortune: Sudanese Soldiers and the River War was published by James Currey Press. Ron is currently an assistant professor of history at Lesley University in Cambridge, Massachusetts, and lives in nearby Concord with his wife Karen and two daughters, Madeleine and Parker.